Happy New Year, challengers! I hope you had fun with the frost theme! When I told my husband that I thought the theme should be seasonal, but not Christmassy, he suggested "frost". So, Frank, this one's for you! About two years ago, I won a random drawing from the Quilting Arts forum. I received, amongst lots of other goodies, some white opalescent Angelina fibres, which I excitedly packed away in a drawer, where it remained until I went looking for frost. I spread out the Angelina and MistyFused them together on plain white cotton. And left it like that for about 6 weeks, waiting for inspiration. As I was makin' bacon, I decided I could make a tree - using the same technique and, if it turned out, use that with the Angelina/MistyFuse background. This led to some more of the same technique to the strips at the base of the tree. During my canvas-work/cross-stitch days, I had accumulated a rather large supply of fancy, glittery, glitzy threads and fibres, so I added lots of frosty sparkle! Using an over-dyed rayon thread for a bit of subtle colour in the trunk of the tree, I machine-stitched the three pieces to the background, but decided not to stitch down all the branches, because I like the 3D effect. I also like the crumpled effect - the Angelina cannot be ironed any more due to over-heating. I think the 3D effect and the crumpled look add to the harsh, wintery appearance of the piece. After I had finished the machine-stitching, I added a few random opalescent beads in the branches of the tree. I look forward to seeing the more frost - and to the next challenge! 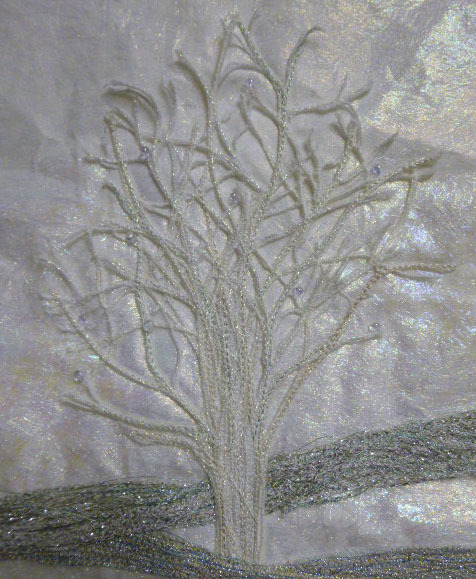 The detail photo shows the various sizes and shapes of the aluminum shavings each is hand sewn onto a quilted background and lots of beading. This piece is also mounted onto a commercial canvas. This is my favorite challenge piece to date. I had this image in my mind of a river on a frosty day - you know when there is a light mist just curling along the water surface and tiny pieces of ice swirling along. Its cold enough to make your nostrils stick together ever so briefly and the snow crunches loudly beneath your feet. I'd like to wish everyone happiness & health in 2013. Well here we are the end of 2012 and time to post our next challenge pieces. I have to admit I was a bit stumped at first - how do you quilt FROST? I was hit by inspiration at the Dec meeting of our local quilt Guild we had a guest speaker from Denman Island Barb Martell and she did a wonderful trunk show - in her show she had a white & grey piece all free cut. I was struck by its elegant beauty. Fellow challenge member Pippa Moore had two tree pieces also set with free cutting. 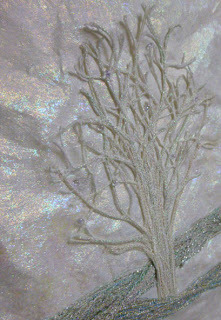 The next morning I got to work I knew exactly what my piece would be - it was like all these influences added together with classes taken with Judy Farrow and Lorraine Roy all came together to make my Frosted Tree. 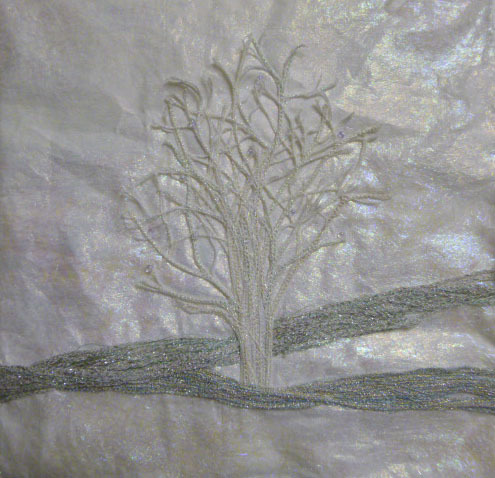 I free cut the outside pieces together then made the tree separately on a bridal satin once I was happy with the tree I then pieced it into my 12 x 12 square. Once the piece was quilted I added beads then stretched the piece over a commercial canvas. Close up of my tree. I really love this piece. I can almost feel the movement of the wind and the cold in the air.